Rissóis de Camarão translated in english means Shrimp/Prawn Patties. 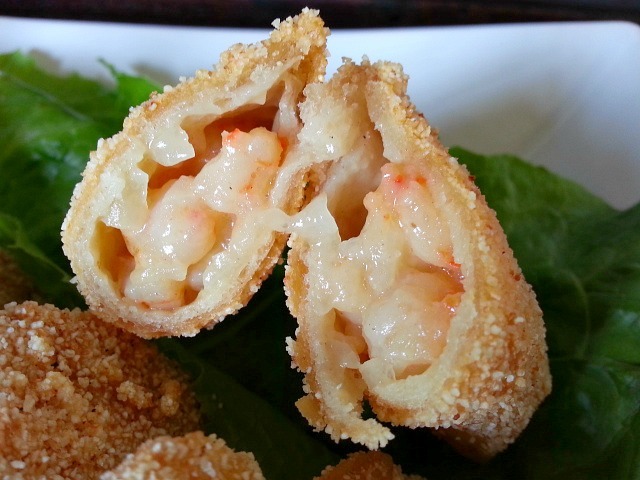 They are deep-fried dumplings or Portuguese pierogies with a moist gooey shrimp filling. There is nothing not to love about these mini appetizers. My recipe uses cream of wheat(rava) and not breadcrumbs for coating as this is what we use in India. In Goa we would make a Bechamel Sauce with butter, flour, milk and flavor it with a chicken bouillon. For this recipe though I have used Alfredo sauce for convenience. Heat the butter and add chopped onions. Saute till translucent. 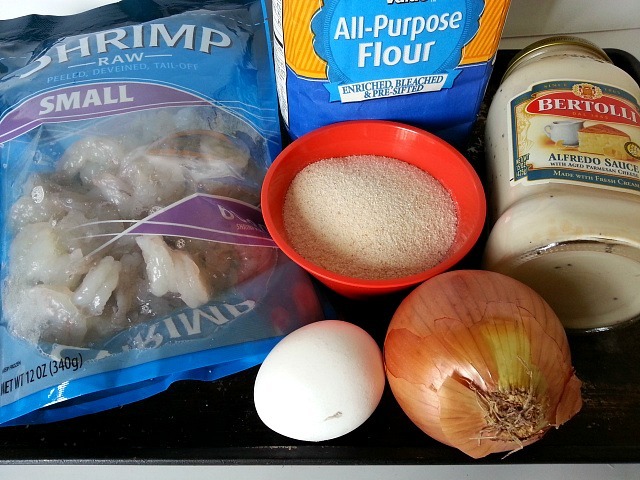 Add the shrimps and saute for 7-9 minutes. Next add the alfredo sauce and season with salt. Saute for another 5-7 minutes till the sauce thickens. Bring water to a boil. Add the butter and salt. Next add the flour mix and take off heat. Knead the dough and roll it to divide into 21 circular portions. Cover with a moist cloth to keep from drying. Roll each round ball to approx 3″ round spoon a little filling (do not over stuff). Dip finger tip in water and then seal the edges to form a half-moon. 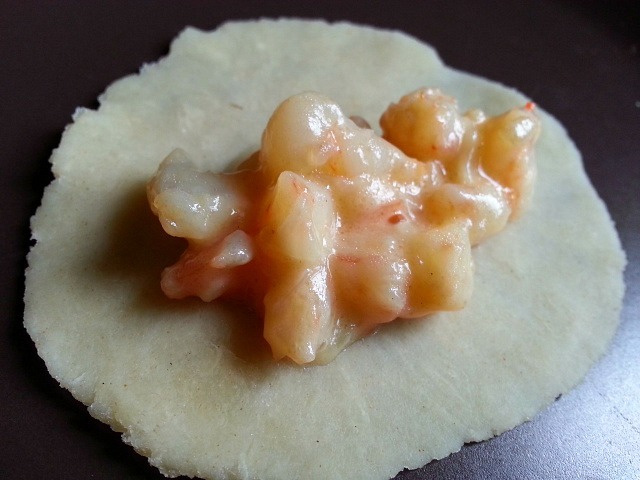 Line the dumplings on a parchment paper on a cookie sheet. 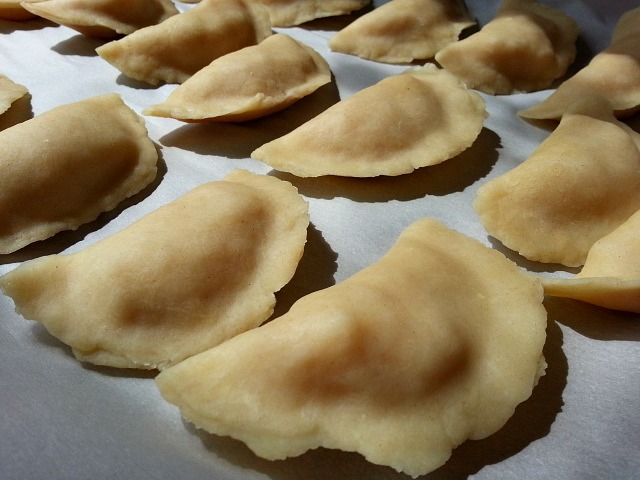 Once’s all the dumplings are done, dip in egg wash with one hand then roll in cream of wheat with your other dry hand. This prevents the cream of wheat to get clumps. Enjoy this spring weekend my dear friends with your family and friends and a nice cold beer and some great Portuguese rissóis de camarão. Yep they do. Especially when you are like me and use cornmeal flour.. Harina Pan isn’t easy to use. These look delish, I have friends coming for dinner at the weekend, I’m deginately going to try them. Thank You so much. I am so happy to hear that. Please let me know how it goes. I just accidentally clicked “spam” instead of “approve” on the lovely comment you posted on my blog about the photo tips. :-(( Would you do me the favor of reposting your comment again? I could not figure out how to undo what I did. Thank you! Luscious combinations ,specially the Portuguese rissoi’s and the cold beer.Cheers. Wow Indian food palette is diverse indeed! They look great! Thank You so much Shy! I’ve never heard of anything like this, Nandini — and they sound like pure bliss! I can imagine that Corona and a wedge of lime with them. Happy spring. 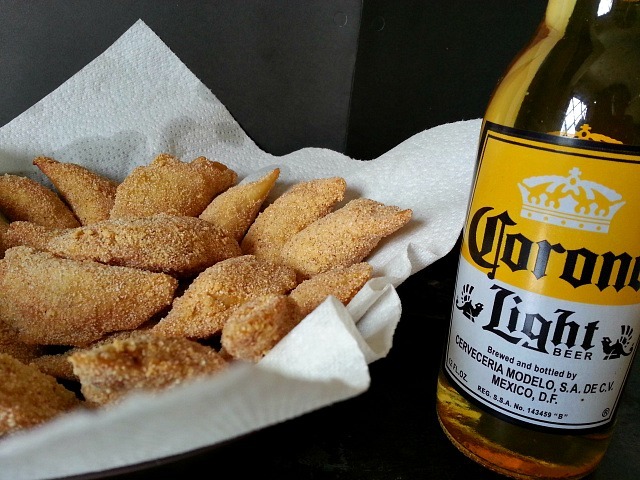 These look absolutely delicious – and the Corona is not bad, either. Lol 🙂 they do look so similar. You guessed it right Loretta. A goan and their beer 🙂 Hope all is well. Have a great weekend! 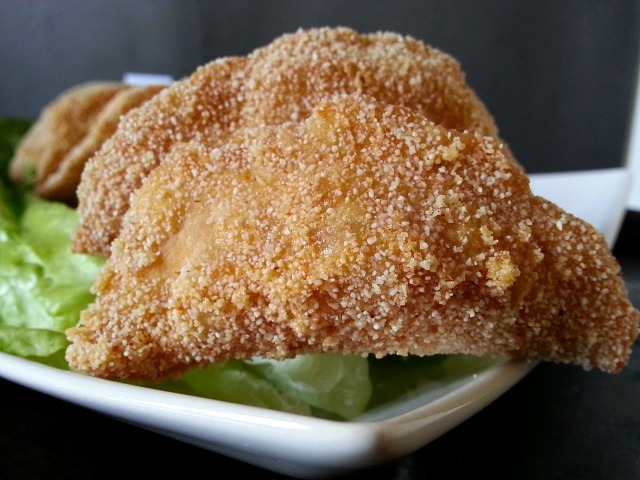 Rissois de camarao,look fantabulous. I was in Wimbledon not so long ago. There was this Brazilian geezer selling rissois de camarao. The rissois looked divine,I could not resist purchasing some. Blimey! They tasted heavenly too. The next day I returned to Wimbledon to get another fix of rissois de camarao. 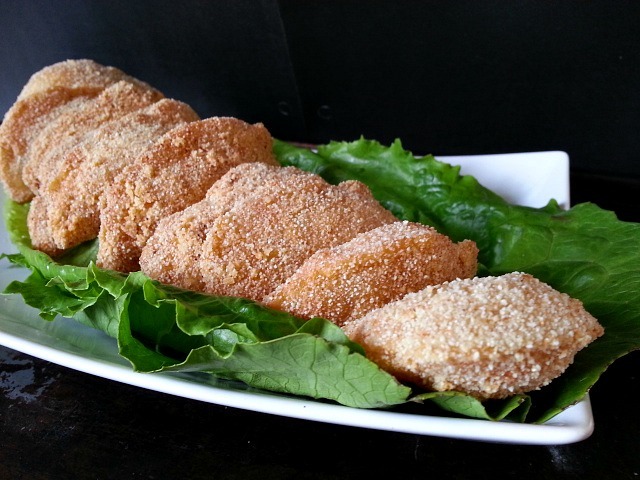 I used to eat rissois de camarao at My sister’s place in Fontainhas,Panjim. And in London at CAFE LISBOA, I already emailed this recipe to Malcolm and My English friends who are into Goan cooking. Let there be more Goan recipes. We were always looking for this recipe.MAMMA MIA! Our prays have been answered. Enjoy! the rest of the day,with whatever You do. Thank You Mr Stan, appreciate your kind words. I feel encouraged to add more recipes. Thank You as well for passing the word around. Wishing you and your Mrs too a great weekend. I have bookmarked this recipe. I am a sea food lover and this can’t get any better. Delicious…. Need I say more than…”Yum”? These look so delicious – great tasty bite with a drink! Thank you so much. They are indeed very tempting. OMG!!! They must be amazing!! …It’s good to know that I can use a bechamel sauce! In Italy we don’t have Alfredo sauce. Thank You so much Serena. We usually would use bechamel sauce but I am getting lazier as I get older and look for shortcuts :-). Btw here in the US they sell the Alfredo Sauce next to the pasta food aisle. Thank You so much :-). My kids enjoyed them a lot. What great appetizers those will make. Thanks for sharing. Nothing not to love .. Very true ! Thank You for seconding that :-). Have a great weekend. You too dear Nandini ! Mmm. You are always making things I wish I could eat as soon as I see the pics. Thank You so much Jueseppi. You have a great weekend. You as well Ms. Nandini, be safe and have fun. I want to try this very soon, maybe this weekend. Is that not awesome. Great minds think alike Monique :-).